Now that the Walking Dead is at the end of it's sixth season, we finally got to see a small glimpse of Negan, played by Jeffery Dean Morgan. Negan is the leader of the group that call themselves The Saviors. In this issue, Rick, Carl, Glenn and a few others are camping for the night, Rick and his group are captured by the Saviors, then, enters Negan carrying Lucille. Lucille is Negan's weapon of choice. It's a baseball bat with barbed wire wrapped around the end. Negan gives a nice long speech about how Rick and the others now work for him, and half of what they have, now belongs to the him and the Saviors. The speech that he gives in this issue is almost word for word as the speech that Negan gives in the T.V. show, minus all of the F-Bombs of course. But, there is a price to pay. 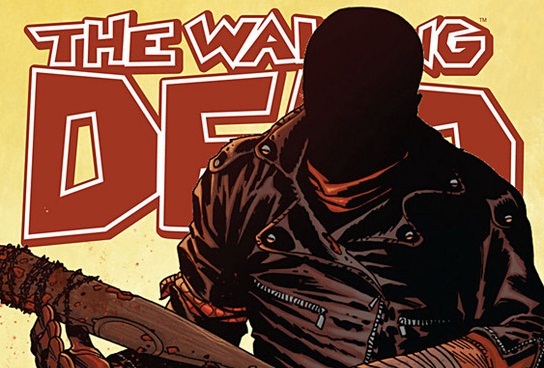 In previous issues, Rick and his group have killed members of Negan's Saviors, many members. Since he can't collect anything from Rick and his group if he kills them all, he decides that killing one of Rick's followers will suffice, and like a kid in the schoolyard, he decides who's going to die with "eeny meeny miney mo". As you probably guessed by the key issue notes above, Glenn is the poor sap that ends up having his head gruesomely bashed in by Negan. Issue #100 had a very large print run of 335,082 according to figures at ComiChron.com. It had the highest print run of all comics for the month that it was published. It is also a milestone issue, therefore Image Comics felt like they needed to print a ton of variant covers for this one too. There are about 14 different covers for this comic and made it all the way to a third printing. I don't know what the print runs are for all of the different variant covers or the second or third printings, I only intended to tell you the numbers for the original first print copy. And as with all comics with so many variant covers, trying to find a high grade first print can be a bit of a chore. I got a little confused at looking at the CGC census for this one. Many of the variants are listed on there and trying to find the numbers for the first print copy is, well, confusing. So, I'm not going to try to tell you how many copies have been graded so far. I may do an update if I can figure it all out, but for now, I'll just go straight to some sales figures. 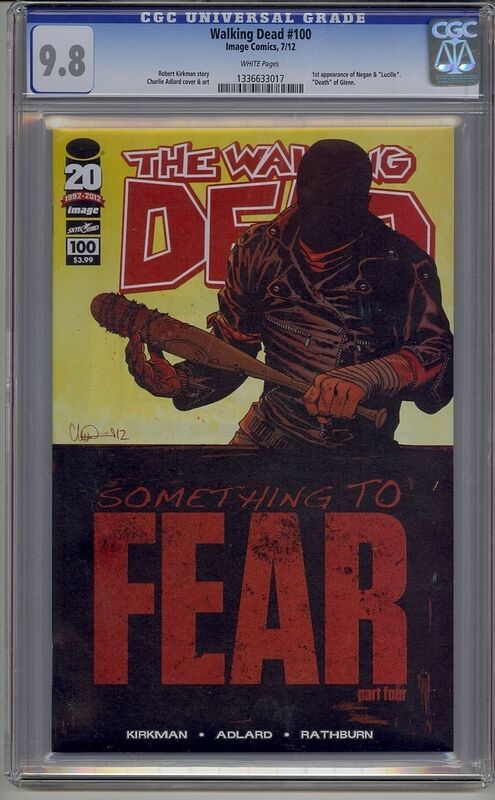 Most grades have seen a nice rise in value since the announcement that Negan was going to appear in the Walking Dead T.V. series. The exception is 9.8 grade copies. 9.8's have seen a small decline in sales recently. A majority of the copies on the market are 9.8 copies, and that may be why sales for this grade have kinda stalled out a little. However, there have been 3 sales for high grade 9.9 copies. Over the last two years, sales have jumped from $137.50 in June of 2014 to $420 in June, 2015 and all the way up to $860 in April of this year. If you have an ungraded copy of this comic, you may want to think about sending it in to get graded, but only if you think it's a high enough grade. Even 9.8 copies are selling around the $100 range as of right now. Do I think that these prices will sustain? Not really. After all of the hype of Negan appearing on T.V. and the over abundance of copies that were printed, I think that prices will come down and flatten out a little after a while. But hey, I'm no expert and have been wrong about things in the past.